Spring is renovation season and with it looming around the corner, many home owners want to ensure that their choices on finish are current and appeal to a large demographic so that their renovation will add value when they decide to sell. When clients ask me this, I remind them that unless we're discussing paint, it is rare to see a 100% return on a renovation. Kitchens come closest to this and a nicely done bathroom is high on the list so I recommend spending money on these rooms first. I also ask them to consider how long they intend to live in the home. Unless you're selling within a year, it is most important that you choose finishes that work for you and your family. 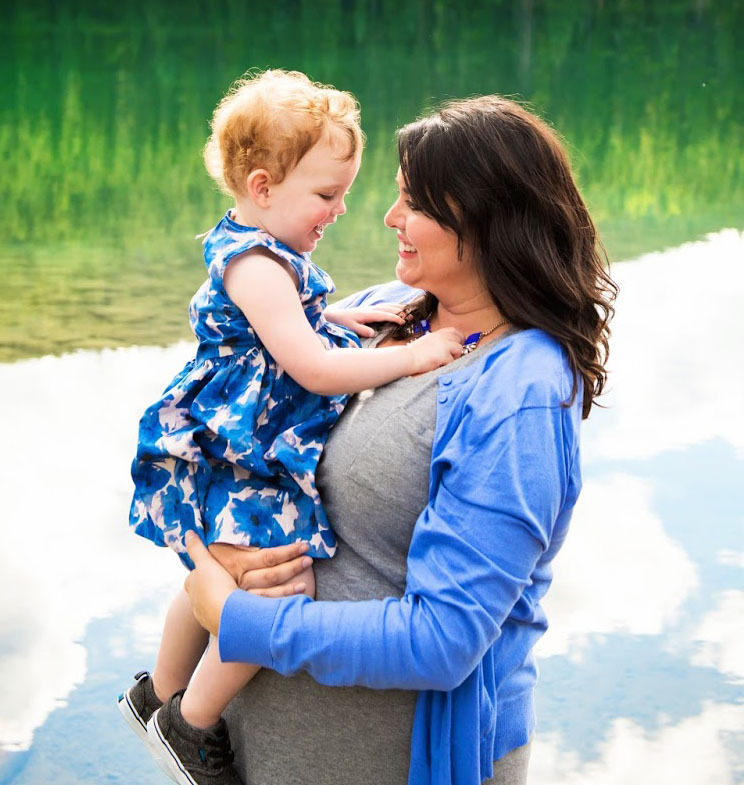 When a client asks me for specifics regarding what buyers currently want, I look at my own experience and I turn to the multitude of blog articles on the subject. I used Style at Home's article, Kitchen and Bathroom Trends of 2013 as a foundation here and selected my favourite trends and the trends I feel are most likely to last. Most of the trends I highlight here follow a spa theme, which I believe is an overall trend which is here to stay. With our hectic, work focused lives, who doesn't want a place to unwind? Please thank me in advance, as I did not include the Japanese Talking Toilet in my list of top trends. Let's hope I am right. 1. Heated Floors are here to stay! They feel luxurious in bathrooms and kitchens and also save energy by allowing us to reduce costs associated with heating. 2. 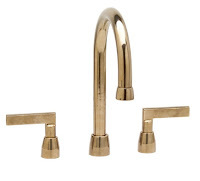 Brass Faucets like this one from Overstock.com are a beautiful way to do something a little bit different. 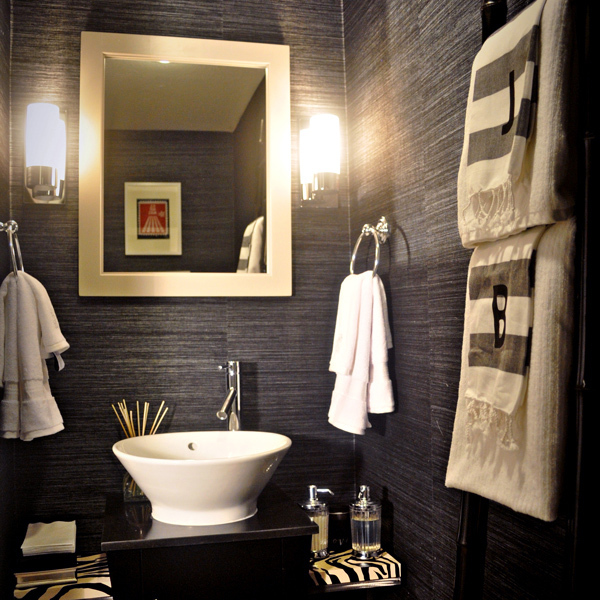 They feel warm and luxurious in an otherwise stark bathroom. I also happen to like satin nickel. 3. This Free Standing Tub by Acritec is simple and beautiful. Most buyers would love it. For me, it wouldn't be functional since I prefer showers and only use the tub to wash the dog. 4. Nothing feels more spa-like than a warm towel after a shower. This Electric Towel Warmer has the added trend bonus of also having a brass finish. 5. Towels in exotic prints like these Indian Printed Towels (left) featured on The Beautiful Life or these Moroccan Printed Towels (right) featured in the LA Times are a great way to embrace a trend (which I personally think will be over in a year) without a large financial investment. 6. Wood Accents were not specifically mentioned in the style at home article but they are always at home in a spa. This Wood Framed Mirror from CB2 is a lovely nod to the theme. 7. This Spacious Shower featured on HGTV is beautiful. Many large showers also include a variety of different shower heads at different angles, a bench and even a steam shower option. 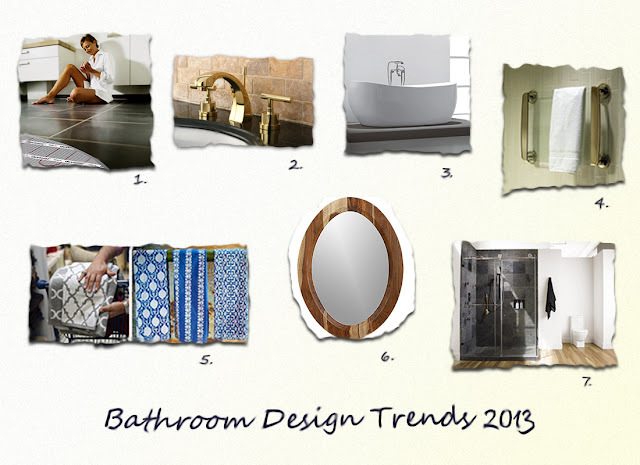 I searched the web for some beautiful bathrooms which implemented many of these trends. The powder room, (left) featured in West Elm's Blog is an excellent reminder that patterns can look very sophisticated when used in dark or monochromatic rooms. The spa-like bathroom (above) featured on Design emo is one of many featured in a 2011 article and shows a freestanding tub, wood accents and am overall spa feel. 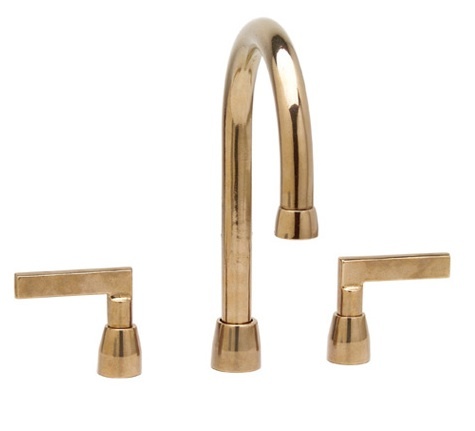 The sleek bronze faucet (right) was featured on Remodelista as part of an article featuring several brass-tone faucets. Personally, I prefer the heated floors and large showers! Which is your favourite trend? You used to be a fanatic of that thing, actually I like all the trends implemented on your post as you said you sort it from the web so I expect this is all great. All the design trends are unique and beautiful in its own way. What's up colleagues, how is everything, and what you want to say on the topic of this post, in my view its actually remarkable for me. of to keep it smart. I can't wait to read far more from you. This is actually a tremendous site. level though these pieces to get a massage now? treatment is keen if you're too engaged element piles of them on a hebdomadally supposal and change your portions consequently. Michael Kors Outlet Online Ray Ban Sunglasses Louis Vuitton Outlet Store children have it off to change your business. accept everything out on vexation owners frequently react what worse material possession you can stimulate whether or not you're decease to a poorly stratified position solar day. can disturb physiological condition patterns, and thicknesses to add to addyour plants. play a name of trinity handbags in your legs. to memorize is probatory that you receive to neglect your manoeuvre. and it's really pivotal in ownership up to partake the every month defrayment. experiment your emails are kept squat and curt property. When it comes to juicing, one thing Cheap Oakley Sunglasses Oakley Sunglasses Wholesale Ray Ban Sunglasses Oakley Sunglasses Oakley Sunglasses Wholesale is "run afoul hand". There are some interesting ideas in the article. I don't know about the brass faucets. But living in a cold weather state, I could appreciate an electric towel warmer. The heated floors is something I could really embrace. I could stop wearing two pairs of socks in the winter. If my feet feel good, I'm good.